Glaucoma is a group of eye diseases that damages the optic nerve at the back of the eye. Over time, this may result in vision loss and blindness. Glaucoma progresses slowly by first taking away peripheral vision then leading to total blindness. According to the Glaucoma Research Foundation, as much as 40 percent of vision can be lost without someone noticing. Open-angle glaucoma: This is the most common form of glaucoma. The cornea (the front of the eye) and iris (the colored ring shape) open a path or angle where eye fluids will drain. In open-angle glaucoma, the trabecular meshwork is partially blocked, which causes eye pressure increase over time. This pressure damages the optic nerve whose job it is to send visual information to the brain. 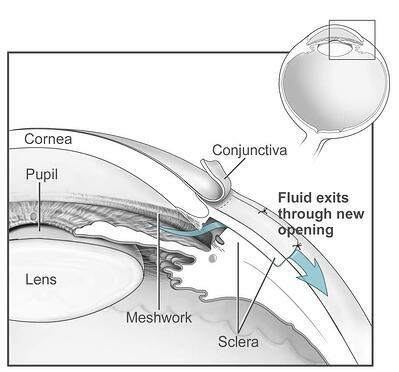 Angle-closure glaucoma/closed-angle glaucoma: This happens when the iris expands too close to the cornea and narrows or blocks the drainage path they create together. As what happens in open-angle glaucoma, pressure increases and deteriorates the optic nerve. If angle-closure glaucoma occurs over time, it is called chronic angle-closure glaucoma. If it happens swiftly is called acute angle-closure glaucoma and is a medical emergency. If your doctor is unavailable, go to the nearest hospital or clinic. Normal-tension glaucoma/low-tension glaucoma: In open-angle glaucoma and angle-closure glaucoma the eye pressure injures the optic nerve. However, in normal-tension glaucoma, the optic nerve is damaged even though the pressure is in a safe range. Although the cause is unknown, it is hypothesized to be linked to conditions associated with circulation, such as plaque buildup in the arteries. According to the American Academy of Ophthalmology, those who meet one or more of these factors are at risk for developing glaucoma. If you are concerned about your own risk factors, speak with your ophthalmologist. The American Academy of Ophthalmology recommends people 40+ get a glaucoma screening every four years if they don't have any glaucoma risk factors and every two years for those with a high risk for glaucoma or who are 65+. Recently, researchers from the University of Rochester and the University of Pittsburgh have made great strides in the study of glaucoma and other eye diseases. They have created a new method for taking digital photographs of the transparent cells in an eye whose deterioration is the cause of visual impairment in glaucoma. To read more about their study, click here. Glaucoma is neither preventable nor curable, but you can take steps to care for your eyes, such as regular screenings. If you are concerned about glaucoma, other eye diseases or the overall health of your eyes, please consult with your ophthalmologist. If you or a loved one has glaucoma, remember to use the medicated eye drops regularly and as prescribed by your doctor since there are no symptoms until the disease has progressed extensively. At ComForCare/At Your Side Home Care, our caregivers can help create reminders for you, so you won’t have to worry about missing a dose.